Version 1.1.2 was just released! Additionally you can export your workout as TCX, which now also includes the power in watts. This entry was posted in Allgemein on 2. August 2017 by Gunther. The upcoming version of RowingCoach features a new way to train indoors: When you start a workout with your Apple Watch, you can use your iPhone as a display to show your pulse, current stroke rate, calories burned and the elapsed time. So even the simplest rowing machine becomes smart with your iPhone and Apple Watch. Using this feature is simple: Just open the RowingCoach app on your phone and position it in a convenient place. Ensure that the “Mirror Watch” setting is enabled and Apple Watch and iPhone are not in the Flight Mode. Next, start your workout with RowingCoach on the Apple Watch. That’s it! This feature was implemented after a user request, thanks a lot for your input! This entry was posted in Allgemein on 12. March 2017 by Gunther. The coming update will feature iCloud synchronization. This means that you can access all your workouts from every device. So when you use your Apple Watch to record a training session, you can have look at the map with your large screen iPad afterwards. iCloud synchronization also means, that you do not loose any data when getting a new iPhone! This entry was posted in Allgemein on 10. March 2017 by Gunther. The new week brings a new update. It features ForceTouch support. 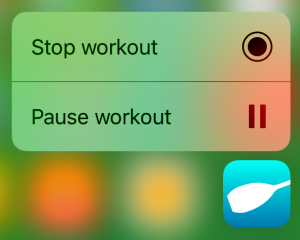 Now you can start and stop workouts without the need of opening the app first. Just press hard on the RowingCoach app icon and a pop-up appears. There you can instantly start the workout. This will get you to rowing even faster! This entry was posted in Allgemein on 6. March 2017 by Gunther. Just after a 9 hours of review, the RowingCoach app for iPhone and Apple Watch is now available in the Apple Store for free. The version includes Siri capability, so you can just use tell your device to start a recording. Additional to the beta version, you can also enable a notification when you covered a certain distance. This entry was posted in Allgemein on 1. March 2017 by Gunther.